Like most animal lovers, I was saddened by the killing of Diesel, a French police dog, during an anti-terrorist raid outside of Paris. It is heartwarming that so many people online have been posting their condolences and words of love for Diesel. In order to see her death in the context of the big picture, I'd like to bring up what I believe are two important points. 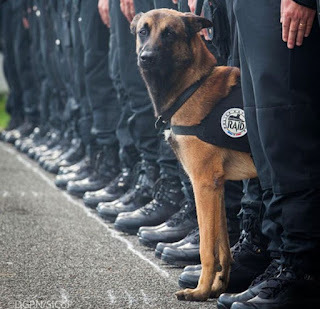 First, the fact that dogs are recruited into a police force, any police force, is not ethical. Opponents of the practice rightfully bring up the harsh training methods for police dogs, and the inevitable abuses thereof. Training methods aside, however, there is an even simpler reason: People sign up to be police officers, dogs do not. Police work can be very dangerous, and people who sign up for this work know the risks involved. While it's OK to put yourself at risk if you choose to do so, putting another sentient being in a dangerous, life-threatening situation is not alright. Most of you who are familiar with my position on animal rights know that I believe that it is unacceptable to use and abuse animals for our benefit. While there is an argument to be made for using animal companions such as seeing-eye dogs, using dogs to check for explosives (as Diesel was used) or to check for drugs is not OK. When it comes to the latter (drug-sniffing dogs), one should point out that recent studies have shown that these dogs' reliability can be as low as 15%. A pretty low percentage considering all the suffering these animals have to go through. So, while contemplating Diesel's unfortunate fate, one of the things you should consider is that maybe it's time to stop using animals in the police force. Second, if you feel sorry for Diesel, posting a quick "this is so horrible" message on social media is not enough. Why not supplement your kind words with a small donation to a charity that helps dogs in your area? Whether it's a no-kill shelter that helps save dogs and cats from being killed due to time-limitations, an organization that rescues animals from the street (in areas where this is a problem), or one that organizes spay/neuter programs, a small donation in Diesel's name (and memory) would go a long way to prevent the needless death and suffering of these animals. After all, in the US alone, over a million dogs are killed EVERY YEAR in shelters that have time limitations. In other parts of the world, these animals often roam the street and are abused and killed in all kinds of inhumane ways by the local population. These animals won't be helped by a "RIP Diesel" message in a forum, but would really appreciate it if the organization that helped them offered them a bit more food, or shelter, thanks to the money that you donate. The ones that are waiting for adoption would surely appreciate it if you adopted one of them. While we lament the fact that this brave dog was killed, let's not forget that we can and should help other animals that are still alive and require our assistance.